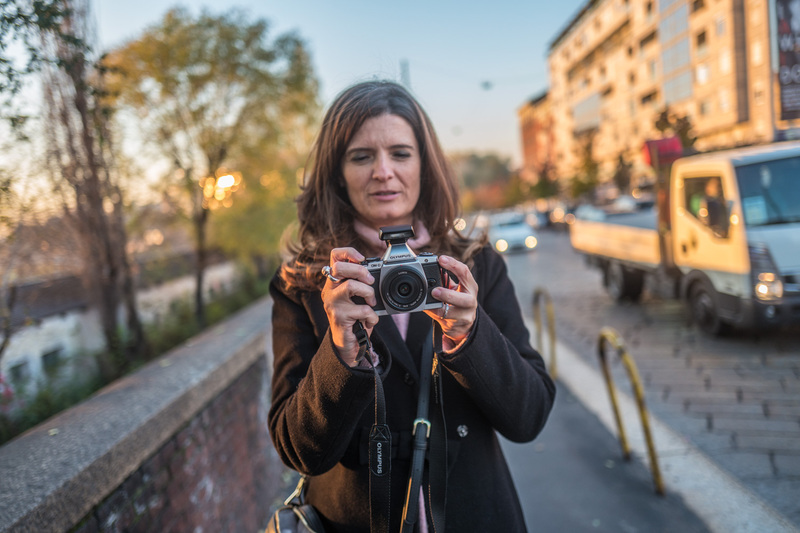 For this edition of @womeninstreet Stories, we meet Fabrizia Ascatigno, find out her street philosophy, and what it is like shooting in Milan. In Part I, Francesca Magnani asks Fabrizia some questions (this was a live broadcast.) In Part II, we accompany Fabrizia in action near Fondazione Prada. Taking photos, more conversation, and a stop in a local cafe for some good Italian coffee with dessert. Please tell us a little about yourself. Where are you from, where do you live now? Your background with photography, how and when you were drawn to the street genre. I have been living in Milan for many years, and this is where most of my photographs are taken. Photography has always thrilled and intrigued me, but only recently did I discover “street photography,” attending a course on the topic. Then, I was struck by the great photographers, and by the charm of their photographs. So I take pictures for passion, fun, and sometimes for work. I wander the city, sniffing out eccentric characters, looking for funny situations, and tuning into scenes that spontaneously erupt on city corners. How do you define “street photography” for yourself? To me, street photography is looking at people sincerely, giving room for curiosity. It is staying among people, and having fun. Does your local situation affect your work? There are places like stations or airports in which photography is forbidden, but in a large city full of people and tourists as Milan is, there’s no problem going around and taking photos. You are almost invisible. I’m not aggressive, I don’t use flash, and I always respect people. Only a few times did I have to delete photos, as people didn’t appreciate being photographed. This is not a problem for me, if they ask, then I simply delete the pictures. In what ways do you think being a woman has affected your work? Women are more sensitive. I think they look at reality with different eyes, more empathy, and are more involved with people and situations. Color or black and white, digital or film? All of my most recently published work is in colour, which helps me in composition — it gives life, emphasis, and intensity to my photography. I have always admired Alex Webb, Saul Leiter, and many others that use colours to let the eye move, communicating messages. I can’t resist colours when they are brilliant under the sun’s touch. My camera is a mirrorless, and I can be almost invisible in the street in this way. I take only digital photos, so I have the possibility of some control in post-production. What photographers can you name who are the most inspirational to you? One of the first I admired was Joel Meyerowitz, for his energy and his continuous propensity for new experiments. I like English photographers like Martin Parr and Matt Stuart, very different from each other. They use irony to tell about the funnier aspects of life. There are not as many female street photographers from the past, among them, my favourites are Diane Arbus, Helen Levitt, and of course Vivian Maier. I’m inspired by Vivian Maier’s photos — her street portraits, her unusual characters, and the humorous opportunities offered by the street. Sometimes, when I’m in the street with my camera, I wonder what she would have shot if she were with me. Today, the number of female street photographers has increased, and I can see their work on the web, and in social media. I think they’re exceptionally gifted. Is there a special project you are working on? Or recurring themes you are often drawn to? I have some recurrent subjects — I like street portraits, and in particular couples, funny adults, and children. It’s interesting to me the funny aspect of situations, as well as body language: hand-gestures, and facial expressions. When someone smiles looking at my photos, I have met my goal. I have just finished a study about sunlight in Milan. These are minimal pictures, where the sun is the main actor that gives light to the people. I have always admired certain artists’ use of light, the way they realize its placement in their images. For example, the paintings of Edward Hopper, the films of Woody Allen, and the photography of Trente Parke. I wanted to effect something similar. But the real inspiration for my study came when I read the book Sopresi nella luce Americana, by a great Italian photographer, Franco Fontana. What I began to understand through his series, is the importance of light in examining the urban landscape — its many buildings, all of its signs, and all of the figures in motion, and all somehow scattered, in the American streets. I wanted to experiment with this idea in Milan, the Italian city that sits at the foundation of respect from other Italians, with its grand avenues and classic buildings. The protagonists are the lines, the bands of horizontal and vertical color, the unrelentingly penetrating light. The people walk as though moving through the recesses, somehow a symbol of the human spirit. In addition to your themes of humor and sunlight, we find more intimate candid portraits, showing a range of emotion, particularly in public transport. For many years I have taken the metro to get to work, and I always liked observing the people, imagining their lives, their thoughts. At any given time of day, there is always someone or something interesting to photograph in the metro, it’s where I took my first street photographs. The cars were packed with tourists, nobody gave you much mind, and I felt at my leisure to photograph. In this setting, it’s possible to obtain more serious portraits. I have focused mainly on women, of all ages. I find them to be more fascinating than men from a photographic point of view — their colored lips, their scarves and capes, their jewelry and other accessories, makes each woman unique. Do you want to submit your work to @womeninstreet?